Extra collar for SportDOG SD 425X, 575, 825X, and 875 systems. PRE-ORDER. Expected to ship by May 2019. Original extra collar for SportDOG SD 425X, SD 575, SD 825X, and SD 875 systems. 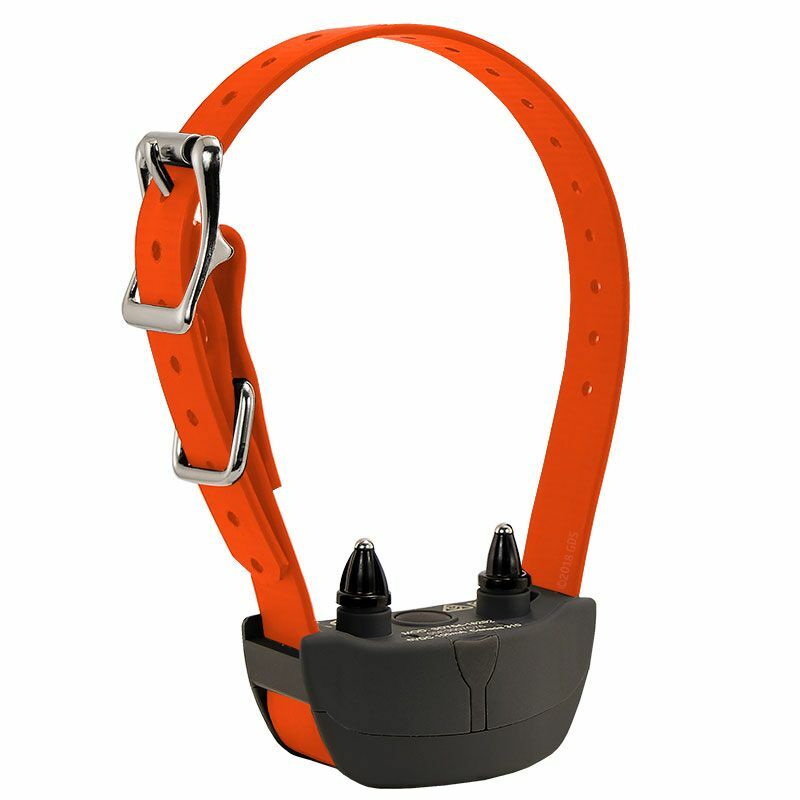 Includes 3/4" orange collar strap that fits up to a 23" neck, short and long contact points, charger and owners manual. 1. Turn the Collar Receiver off. 2. Press and hold the On/Off Button. The Receiver Indicator Light will come on, then turn off in 4-5 seconds. If the On/Off Button is released too early, the Receiver Indicator Light will begin its normal flashing. If this occurs, start over and repeat from step 1. 3. After the Receiver Indicator Light has turned off, release the On/Off Button. 4. Press and hold the Upper Button on the Remote Transmitter until the Receiver Indicator Light flashes 5 times. You may need to hold both units 2-3 feet from each other. If the Receiver Indicator Light does not flash 5 times, start over and repeat from step 1. 1. Program the Remote Transmitter to mode 3 or 4. A. Set the Intensity Dial to the selected mode. B. Turn the Remote Transmitter over. C. With a pen or paperclip, depress and release the mode button. D. When the mode button is pressed, the Transmitter Indicator Light will be solid in color. When it is released, it will flash the same number of times as the mode selected. A. Turn the Collar Receiver off. B. Press and hold the On/Off Button. The Receiver Indicator Light will come on, then turn off in 4-5 seconds. If the On/Off Button is released too early, the Receiver Indicator Light will begin its normal flashing. If this occurs, start over and repeat from A.
C. After the Receiver Indicator Light has turned off, release the On/Off Button. D. Press and hold the Upper Button on the Remote Transmitter until the Receiver Indicator Light flashes 5 times. You may need to hold both units 2-3 feet from each other before this occurs. If the receiver light does not flash 5 times, start over and repeat from A. 3. Program the second Collar Receiver the same way using A through D above, but using the Lower Button in place of the Upper Button. 4. Program the third Collar Receiver the same way using A through D above, but using the Side Button in place of the Upper Button.